Point of a Million Connections: Why Land? When I started grad school, I received the good advice to create 10-second, 30-second, and 2-minute spiels in response to, "And what is your research about?" I received the advice, but I didn't follow it. 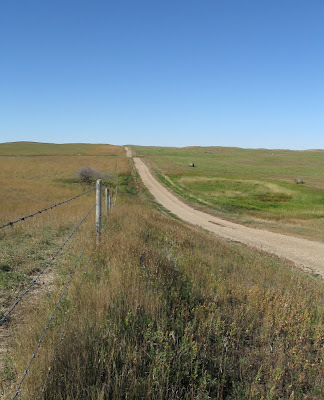 I have a 5-second spiel - "Alternative agricultural land tenure in Saskatchewan" (I talk fast) - and then I have a lot of flailing about as I add explanations and qualifications. Truth is, I don't know why I ended up focusing on land. I remember having to come up with an idea for a grant application at the same time as I was reading Pierre-Joseph Proudhon ("property and robbery are synonymous terms") for a class on theories of justice, just months after my father passed away and left the state of the family farm in limbo. Out of that stew, an idea about land emerged. And then it mutated. If you've ever had to explain to an 18-month old why he can't walk across a neighbour's lawn, you might realize how ridiculous ideas about property are. If you go on to read Locke, you realize his ideas about labour and property conveniently justified dispossession of aboriginal peoples. Then when Jun Borras tells you that property rights are not things, but social relationships, you get interested. And when, with Jennifer Franco, he tells you that "Ultimately, food sovereignty is about effective control over wealth and power", you get excited. So. Today, I am starting a draft of my thesis, trying to sift through my data and analyses, trying to unite all the pieces that I have written for classes and conference presentations, trying most of all to sieve out all of the fascinating, but unfortunately unrelated, food systems information I have amassed in the past two years. Trying to focus. I'll let you know what my research turns out to be about. Then I'll answer the question I posed in the title. Are you considering the cooperative farms of the post-WWII era in Saskatchewan? I think Matador Farm is the sole remaining example from that era. I'm curious to know what other alternative systems exist and what you'll be looking at. The best advice I had for writing a thesis is to sit down and write three pages each day. Some days can be more when you're inspired, but not less. You don't have to keep them, but nurturing the habit of writing will take you a long way. And 3 pages a day will take you a long way to completing in a timely manner. Good luck and looking forward to hearing more. Chris, I'm actually not looking into the co-op farms (I think you're right about Matador). I had to narrow my scope, and the U of S has a cooperative centre that has done some work in that area, so I'm not going into it. There are a couple of agricultural land trusts that I am looking at. I know you have more examples of that sort of thing in BC (I've presented with Hannah Wittman a couple of times and have seen her work on alt land tenure). What I'm looking at more, though, is the possibility for food sovereignty in both the existing forms of alternate land tenure and in the models/changes that are being advocated for by certain groups. That has lead me down the path of social movements theory. I have three days a week where my children are at daycare and I can work, so that partly explains my slow progress. By the end of the days they are home, I tell myself I am too tired to think and write. However, I need to stop using that excuse and start muscling through it. Thanks for the advice! I have so much respect for people who do academic work while raising children -- it requires a no-nonsense approach that often results in clearer arguments. The land trust, social movement perspective will be interesting. I'll be interested in reading more.